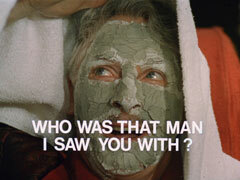 The Avengers : Series 6 : Who Was That Man I Saw You With? Jay Fairfax (William Marlowe) and Perowne (Richard Owens) are waiting to meet a contact. Fairfax tosses a coin and Perowne gets to go - Fairfax tells him to find out who he is and what he has to sell. Around the corner, Perowne sees the contact - Zaroff (Alan Browning) - slump to the ground and searches him. While he's examining his wallet, Zaroff pulls out a pistol and shoots him. Fairfax hears the shots but Zaroff escapes before he arrives. Perowne croaks the name Gregor Zaroff and hands him the bank card he found in the wallet. Zaroff arrives back at his employer's den, where the shrouded Dangerfield is receiving a manicure from the scantily-clad Kate (Nita Lorraine). He reports mission accomplished and Dangerfield raises a glass to "the girl who will make all our dreams come true" - Tara King! 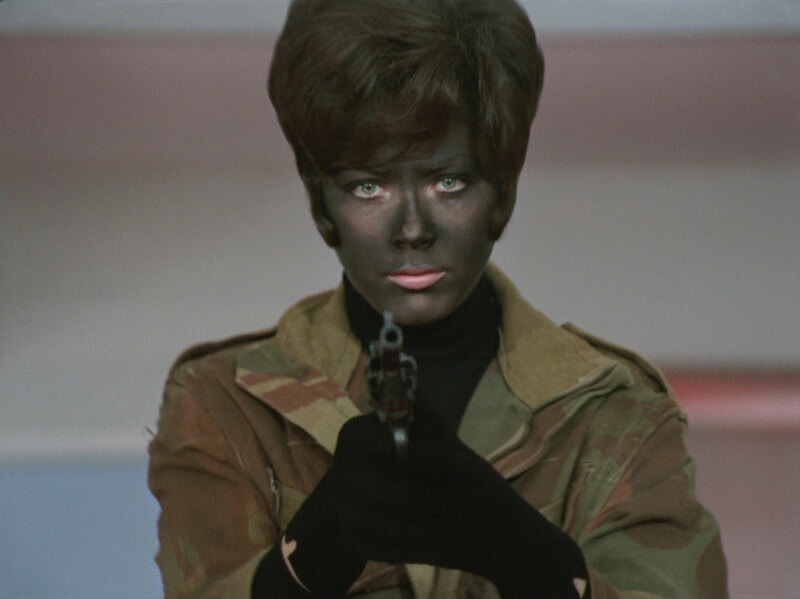 A military installation in the country - Tara, in military camouflage and blacked out face, evades the sentry then slips through a concealed door. She attacks the soldier inside, Cpl Powell (Ken Haward), defeating him easily, then takes care of the relieving sentry, Hamilton (Ralph Ball) before descending in the lift. 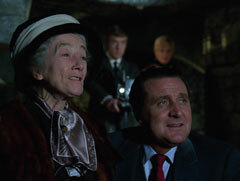 She stops it between floors and crawls through the ducts towards the War Room, where Gilpin (Alan MacNaughtan) is telling General Hesketh (Ralph Michael) they can track military aircraft anywhere in the world, and missiles fired at Britain can be detected in 32.6 seconds. Hesketh asks what they do if an attack is detected and he's introduced to the "Field Marshall" - a computer, complete with rank and decorations, which "creates an impenetrable barrier, a shield of absolute safety". Hesketh asks what would happen if it were damaged or destroyed - Gilpin says it's impossible as Pye (Neville Marten) looks on, but concedes Western Europe would be a sitting duck. Tara sneaks into the room as Gilpin explains how the computer won its medals. He turns to show the General the rest of their operations and Tara rushes at the computer. Her gun misfires and the box slides down out of harms way - she's grabbed by the guards and Gilpin calmly tells her she was in the magnetic field, preventing her gun from working. Gilpin introduces her to the startled Hesketh, and explain Tara's assignment is to try to attack the computer; she tells Hesketh she tried four times and failed miserably every time. The lift arrives and a beaming Hamilton congratulates her on surprising him. 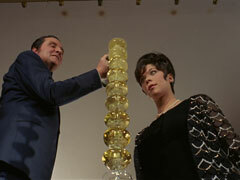 Tara returns home and finds Steed there - he tells her he designed the War Room defences. While she's changing, some flowers, accompanied by a pearl necklace arrive, with a card signed "Affectionately, G." Steed leaves and bumps into Zaroff in the hall - he notices the initials GZ on his briefcase as he hands it to him. A moment later, Tara's door bell buzzes - it's Fairfax, who had been tailing Zaroff. He telephones Mother to report he's lost him - enduring a barrage of abuse - then Zaroff rings. He convinces Tara to leave the flat then Dangerfield rings after she's gone - he says, "Tara, it's all set, Zaroff is waiting" when Fairfax picks up the receiver. Fairfax chases after Tara, who drives to an isolated 'phone box where she's told to look under the directories. Fairfax sees her remove an envelope then run to her car. Dangerfield meanwhile orders Kate to deposit Zaroff's personal cheque for £2,000 into Tara's account. Fairfax returns to Tara's apartment and sees Zaroff leaving, carrying an identical envelope. Zaroff ostentatiously removes its contents - a War Room dossier. Tara wanders around the War Room, pretending to sneeze to cover the sound of a miniature camera but when she tries to leave the alarms clang and she's grabbed. Gilpin smiles and tells her they have a film emulsion sensor as he exposes the film. Fairfax meanwhile reports his suspicions to Mother (Patrick Newell), who is furious. He is disbelieving, but still reduces Tara's security rating to Zero minus and orders surveillance to commence. Zaroff meanwhile is wandering around her flat, touching as many items as he can. Steed and Tara arrive, watched by Fairfax, but she senses something is wrong - a man bursts out of her bedroom and escapes. 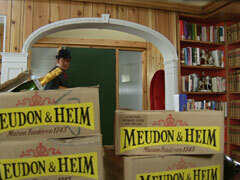 Tara checks but finds the flat strangely neat, while Steed spots Fairfax waiting outside. After Steed leaves, Tara gets out her darkroom equipment and removes a roll of exposed film from her camera watch, which had evaded detection. Steed goes to see Mother to find out why Fairfax is outside Tara's flat and finds him with the man who had escaped - Aubrey Phillipson (Bryan Marshall), a new recruit. Phillipson reads a report to Steed and shows him Zaroff's cheque. He then tells him Tara requisitioned a micro and a miniature camera from stores and they suspect she's managed to smuggle film out of the War Room - film she's developing prints of. Steed asks to handle the case and is given 24 hours. Dangerfield rings Tara and tells her to go to "that address"; outside, Zaroff stops her on the footpath and allows himself be filmed by Fairfax talking to her before she drives off. Fairfax follows Tara to Maple's Garage while Steed arrives at her flat and finds the photographs. Mother calls the flat, telling him to get over to Maple's Garage, where Tara waits and watches as Fairfax slowly creeps towards her. someone shoots him and throws the revolver against his corpse - Tara picks it up just as Steed arrives. "He's dead", she says and Steed replies, "With your gun". Dangerfield beams at his reflection in the mirror and says it's a perfect fit - not his new suit, but their concocted evidence against Tara. Zaroff's unsure if it's enough and Dangerfield tells him there only one more nail for the coffin then they can collect their fee. Tara meanwhile is being grilled - Mother plays the film of her talking to Zaroff and Phillipson asks her to explain Zaroff's prints in her apartment, and his gifts. She can't of course and her explanation of the photographs is disbelieved. Mother tells her her security rating is reduced to Zero minus one and she is to stay at her apartment until called for. Tara promptly escapes Phillipson's house arrest - Dangerfield sends Zaroff to get her while Steed is directed to the 'phone booth at Lynstead Woods. Inside the E-K directory is an envelope containing some film and when he returns a man bumps against him in the street. 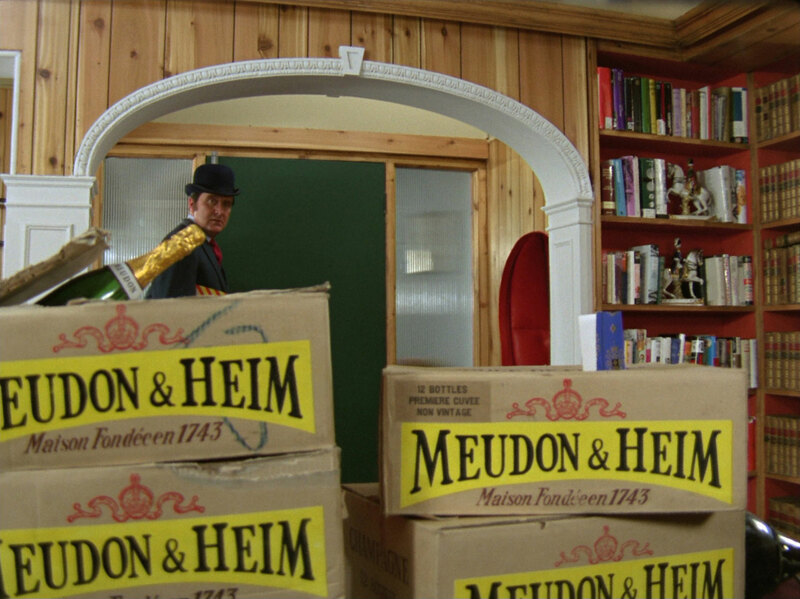 Inside his apartment are crates of champagne, apparently a gift from Zaroff, and Tara lies on the floor behind the sofa. Tara gets up and shows him how compromising the evidence is - she show him a polaroid of him talking to the man in the street, a friend of hers, but points out it seems they know each other from the photo. 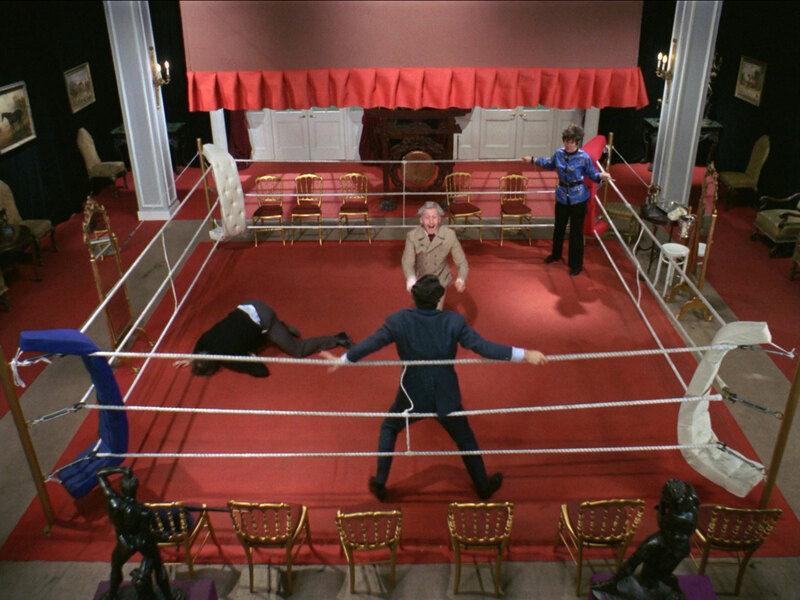 She tells Steed she's ben framed by Zaroff and they ponder why - Steed goes to return her to custody but Zaroff knocks him out at the door and captures Tara. Dangerfield has her dressed in Kate's clothes, while Kate dons hers and is given an air ticket, passport and briefcase identical to Tara's. Steed returns with Miss Gladys Culpepper (Aimee Delamain), an expert lip reader who views the film and confirms that Zaroff asked Tara the way to Wilson Street, then asks the cab to drive him to the Baronet Sporting Club, Edgechester Place. Steed kisses her in thanks and leaves Mother to pay her £200 fee - Mother receives a call to say the War Council has decided to dismantle the Field Marshall, that they believe is now compromised. Dangerfield is explaining that as soon as they knew she had War Room duty, they laid evidence to suggest she was working with enemy agents. It's all a plot to make the Ministry believe security has been compromised so that the automated defences will be dismantled, giving them a 48 hour period to launch a massive missile strike on Britain. They prepare to kill her and she asks for one last cigarette - Zaroff and Dangerfield are surprised when Steed calls out, "But you don't smoke!" and she kicks away Zaroff's revolver as he turns around. 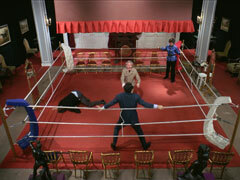 Steed defeats them, with a bit of help from Tara and says he must find out one last thing from Dangerfield. Tara asks if it's which government he was working for, and Steed replies, "his tailor"! To celebrate, Steed constructs a champagne fountain from the crates delivered by Tara in her frame-up exercise, and they toast each other from it.